Ruth is 54, retired from nursing for the elderly, married to wonderful guy George for 32 years October 9th, who is retired from the City of Hastings Waste Water Treatment Plant as a Lab Tech. They live in Woodland, Michigan and have for the last 25 years. Ruth and George were both born in Hastings Pennock Hospital. George was raised in the City of Hastings and Ruth lived in the country about 5 miles from Hastings. They both attended Hastings High School and graduated George in 66 and Ruth in 68. They have no children unless you count their three dogs that they have Teddy 10, Cody 10, both these dogs are Shelties and Coco 4 who is a long-haired Chihuahua and two cats Tigger yellow short haired and Jezz grey and white long-haired cat. They do have a daughter of their hearts Traci, she is actually their niece but since her mother Vicky's death she has become like a daughter to George and Ruth. Being she was an only child and being Ruth and George were childless the Lord blessed them all by bringing them together. They have four of the most wonderful grandkids, Caitlynn 9, Sarah, 7 Ryan 6, and Emily 3. Ruth come from a large family of 3 sisters and 4 brothers, George has 1 sister and 2 brothers between the two them they have 20 nieces and nephews and 10 grandnieces and grandnephews. George and Ruth love gardening and put in a big garden every year. They enjoy landscaping and putting in new flowers and plants every year and their yard is always a work in progress. For example in 2003, George put in a Banana Tree, Giant Rhubarb and the largest Pampas Grass he could find. Ruth has been a member of the Pennock Hospital Guild for 32 years and was Volunteer and Coordinator for the Barry County Child Abuse Prevention Council for 22 years for Pierre Pelican the Newsletter. Ruth would like to share what it means to her to be a member of the Circle of Friends. Ruth says "It has save my life and I can never put into words how much this Circle has given and done for me. I have been fortune to meet several people who belong to the Circle and not only have they come to my home but to go to there home. We have had a wonderful year in 2003 and I hope that 2004 bring a wonderful, peaceful and joyous year for all." 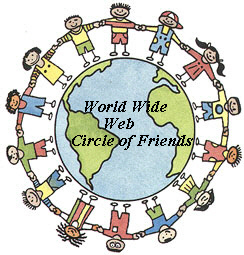 Ruth is our Swap Co-ordinator for the Worldwide Circle of Friends. Part of the fun of a swap is getting to know the other person a little better. Many have made great friendships this way. Visit Ruth's Hompage and sign her guestbook today.